Cindy Haskin-Popp began writing in 2009. She has been published in "The American Journal of Cardiology" and is an ACSM-certified clinical exercise specialist. Haskin-Popp holds a Bachelor of Applied Arts degree in health promotion and disease prevention from Central Michigan University and a Master of Science in exercise science from Oakland University. A high-calorie diet was essential for the Roman soldier, who endured rigorous physical demands both on and off the battlefield. A Roman soldier expended an estimated 6,000 calories daily when he was actively fighting in a war. When not battling with the enemy, the Roman soldier rarely had an idle moment between training activities and manual labor. His daily food ration met his basic needs and was designed to keep him fit for battle. This ration was supplemented with food obtained through hunting, foraging and making purchases from inhabitants of surrounding villages. The daily caloric intake of a Roman soldier is estimated to have been in the range of 3,500 to 6,348 calories. The majority of the Roman soldier's diet was comprised of grains, such as corn, wheat and barley. Grain was the soldier's main source of carbohydrate, and it was ground and used to make bread, porridge, soup and pasta. Approximately one-third of a ton of corn was consumed yearly by each Roman soldier. Meat provided the soldier with protein and iron. Each Roman soldier received a daily ration of approximately 1 lb. of meat, typically bacon. The soldier would supplement this ration with pork, beef, veal, venison and mutton. The meat was often either boiled or roasted -- two cooking methods that are recognized today as healthy alternatives to frying. Cheese was a mainstay of the Roman soldier's diet. It was made from the milk of livestock owned by the soldiers, such as cows, sheep or goats. In addition to meat, cheese was a source of fat for the Roman soldier. Insufficient fat consumption would increase his risk for developing an illness and dying. Each Roman solider received a salt ration, which he used to preserve meat and fish. The soldiers were reluctant to eat unsalted meat, particularly when stationed in the middle of the desert, for fear of developing a food-borne illness. Food poisoning weakened the soldiers, thereby giving the enemy the advantage during a battle. Wine was part of the Roman soldier's basic diet. Soldiers typically drank a vinegary wine, which was of a lower quality than vintage wine. Water was often added to the wine prior to consumption. Special wine was imported for medicinal purposes and was served to the ill soldiers housed in the Roman army's hospital. The location of the Roman soldier's camp site determined the types of food and drink that were readily available for consumption. Various fruits, such as apples, cherries, peaches and plums, were enjoyed by the Roman soldier, as were different types of nuts, such as walnuts, chestnuts and hazelnuts. Honey was used to sweeten dishes. Consumption of beans and lentils was also common. In their account published in "Histoire des Sciences Medicales," historians E. Fornaris and M. Aubert refer to the Roman soldier as "the misunderstood athlete." They liken his caloric requirements to those of a modern-day athlete. 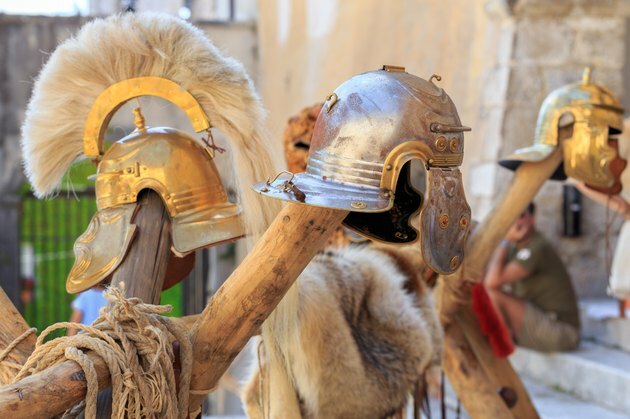 The high carbohydrate content of the Roman soldier's diet, which accounted for 78 percent of his total intake, was suitable to replenish the energy stores depleted by the demands of his lifestyle. This is consistent with the recommendations of the American College of Sports Medicine for athletes in training. Athletes need to consume more calories than the general population, and the majority of these extra calories should come from carbohydrate sources such as grains. iRomans: What did the Roman Army Eat?